ezscheduler makes it easy to schedule jobs, appointments, work orders, and more! Whether it be grooming, repairs, pool service, or even simple tasks around your store, your company thrives on a well-organized schedule. 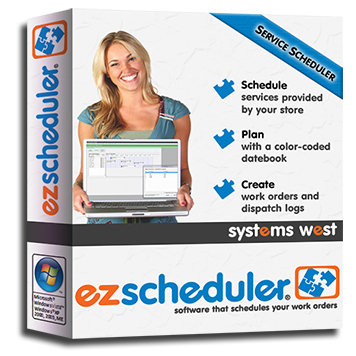 ezscheduler is user-friendly software aimed at helping you organize the scheduling tasks of your store. Once you make the move to ezscheduler, you'll be amazed at how easy it is to run your services. ezscheduler seamlessly integrates with ezpos by sharing Customer data to make it easy for you to easily move between point-of-sale and service scheduling activities. All your current Customer data will be automatically imported to ezscheduler when you connect to ezpos the first time. From there on, Customers will remain synchronized. It's that simple.